A helicopter with seven people on board crashed in a dense forest area in Nepal on Saturday, killing six of them including a foreigner. A woman has miraculously survived the accident. The Altitude Air helicopter, AS350 B3e, which had gone missing, crash-landed in the forest area at Meghang Rural Municipality in Nuwakot district, 125km west of Kathmandu, according to eyewitnesses. The wreckage of the ill-fated chopper piloted by senior captain Nishchal K.C. with six passengers, including a Japanese trekker, was spotted in a remote location in Nuwakot district, said Nima Nuru Sherpa, Managing Director at Altitude Air Private Limited. Rescuers recovered six bodies, the report quoted Sherpa as saying. Five Nepalese including the senior captain have been killed. The Japanese national who also lost his life was identified as Hiromi Komatsu, 68, it said. The woman, who was rescued alive, has suffered injuries to her body, the report said. The helicopter which took off for Kathmandu airlifting a patient along with other passengers from Samagaun in Gorkha lost radio contact with Kathmandu tower after flying some 32km at around 8:10am (local time), a source at Tribhuvan International Airport said. The chopper was supposed to land at the Tribhuvan International Airport (TIA) at 8:18am (local time), Raj Kumar Chhetri, general manager at the TIA, said. The reason behind the accident was not immediately known, he said. Sherpa said that the crashed chopper had not caught fire. 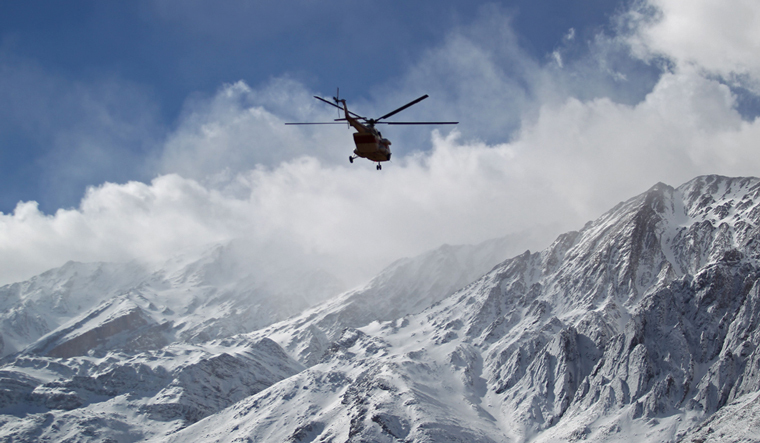 Adverse weather conditions and difficult terrain delayed the rescue effort. A Nepal Army helicopter and a private chopper along with rescuers had reached the spot.